As we mentioned in our last post, there are marketing benefits of sending your law firm prospects, clients, referral partners and vendors a personalized and customized holiday card. But, is a tight budget preventing you from sending a mass mailing of holiday cards? You now have an efficient and cost effective option – an E-card. 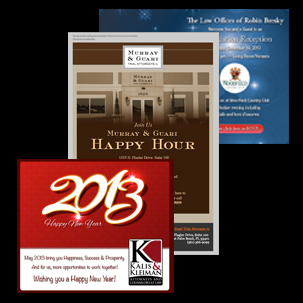 Electronic Cards (E-cards) and E-mails still allow a law firm to brand and customize their holiday E-card. You can also target contacts on your lists (clients versus referral partners) and send them different E-card designs and/or messages (Happy Holidays versus Thank you for the Referral). Other benefits include measurable metrics (allows you to see who did and did not open your E-card) and you can be environmentally responsible and friendly, by not sending a printed card. At BARD Marketing we offer a variety of digital media services including the creation of branded and customized law firm holiday E-cards for a variety of holidays including Halloween, Thanksgiving, Hanukah, Christmas, Kwanzaa, New Years, and more. And, just like the printed cards, starting early (October or sooner) is a must in order to provide you enough time to design your card, prepare your list and distribute your E-card.